Does not discriminate between oil based fluids or water based liquids - absorbs them all! The many fuels and chemicals in an automotive shop can cause an operating and health hazard. Diesel fuel, gasoline, oil, brake and transmission fluid all can be tracked into customers’ vehicles creating a nightmare in customer relations. These fluids also can create hazardous work environments because they are slick and sometimes flammable. Mechanics in automotive garages use TIDDOX's GENERAL PURPOSE ABSORBENT PADS to soak up all kinds of spills and leaks, whether the fluid is oil-based or water-based. The pads will absorb water fluids as well as diesel, chemicals, oil, and fuel. Have your mechanics place one under the wheels of a car when he is bleeding the brakes to absorb the discharge. Then you won’t have brake fluid running across your shop floor. When you remove the heads from an engine, place them on a couple of these pads to absorb the remaining antifreeze and oil that inevitably leak out. Place it under a transmission before you pull it, and the pad will soak up transmission fluid instead of letting it run all over the floor. Not only will this decrease the amount of shop sweep you use, it will keep the shop floor safe to walk on. 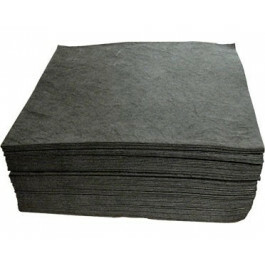 So order a pack of 100 AUTOMOTIVE ABSORBENT PADS today, and you will see the difference in the cleanliness and safety in your auto shop. Each general purpose absorbent pad can hold up to 1 litre of fluid. When it is full to capacity, dispose of it the same way you dispose of other shop rags or automotive wipes.